If you are looking for a reliable lead generation service, Wishpond should be one of your top choices. It offers all the necessary services to build, manage and nurture your own lead database. It is also possible to automate your regular marketing tasks. In today’s post, we will take a close look into the service and find out how it can generate more leads for your business. The landing page creator service allows you to create attractive, professional and fully responsive landing page within a few minutes. The simple drag and drop builder will help you to create custom designs from scratch. Alternatively, you can choose any of the 50+ readymade templates. With the help of A/B testing, you can tweak the performance of your landing page. Using pop-ups is an excellent way to build up your lead base. And Wishpond offers different ways to show pop-ups – exit intent, specific time, entry, page scroll, click etc. It is also possible to make the pop-ups display on specific URL’s only. And if you want to create online forms to capture leads, Wishpond has got you covered as well. Features like drag and drop builder, loads of templates, simple A/B testing, CAPTCHA and custom CSS will be very useful for creating any type of form. Social contents and promotions are proven ways to increase the user engagement of your website. Wishpond enables you to create different types of contests and promotions like photo, photo caption, video, vote, Pinterest, essay contests, group offer, referral promotion, coupon, sweepstakes etc. Like any other professional online marketing platform, Wishpond also has a strong email marketing system. You can nurture your leads by sending personalized emails according to their individual details, activity or actions. Once you set up the basics, the system will run automatically. Later, you can check out the analytic to track the effectiveness of your campaigns. Being a professional online marketer, you are likely to use several other services to keep your work simple and organized. Guess what, Wishpond integrates perfectly with the popular online marketing services. First of all, it integrates with popular CRM services including Salesforce, Infusionsoft, Base CRM, OnePageCRM, Close.io etc. to help you capture leads from social channels and blogs. Close integration with email marketing apps like MailChimp, Aweber, GetResponse, Constant Contact, Mad Mini etc. will make it easy to import or export leads to and from your Wishpond account. What’s more, you can also enjoy other services like SurveyMonkey, GoToWebinar, Slack and Twilio with your Wishpond account. So far, we have discussed about the various Wishpond features. Now, let’s take a look at the pros and cons of the platform. We will start with the pros. Lots of readymade templates for e-book promotion, webinar, coming soon etc. Integrates well with third-party services like Salesforce, Eventbrite, MailChimp, Aweber, GoToWebinar, Slack etc. No A/B testing, custom CSS and API access in the basic membership. Basic: $44 per month. One account, 1000 leads, landing pages, forms, contests, popups. Growth: $129 per month. Unlimited accounts, customizable leads, priority support, all Pro features. Wishpond also has a very attractive affiliate offer. By becoming an affiliate, you can earn up to 30% recurring commission for your referrals. You will get the commission when any of your referrals purchase a subscription and/or renews the subscription. There are several ready-made banner ads which you can use to promote the service. The actual case studies will help you to improve your output. Your performance could be tracked by using the integrated GetAmbassador service. Is Wishpond Right for You? 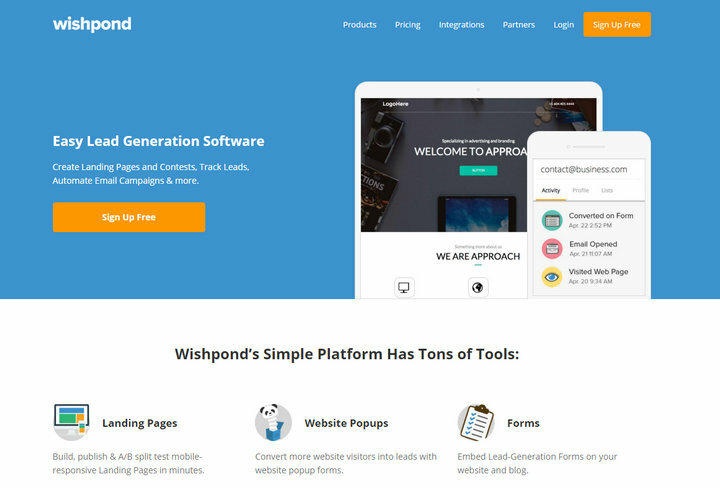 If you are looking for a complete lead generation solution in one place, Wishpond could be an excellent choice. It integrates perfectly with the other third-party services. If you already use these services and want close integration with them, you should give Wishpond a try. In case you are new to online marketing, there are several learning resources for you. The Wishpond academy has case studies, reports and tutorials for different purposes like lead generation, email marketing, ads etc. There are also some webinars to help you get started quickly. If you are confused about the price, there is a free plan and 14 day trials of each premium plans. Get started with any of these and see for yourself. With the diverse range of features, Wishpond could be a great solution for any online marketing professional or company. By using the service, you are getting all the necessary solutions from one provider. These are more than valid reasons to consider the service for your business.